If ever I needed a lie flat-bed on an airplane it was when flying home from Melbourne last Sunday. After several days of eating and walking and eating, my body needed more TLC than being slumped into the window seat confined for several hours. There is so much to tell about my eating adventures I’ll save that for another day. Having eaten so well in a range of restaurants we’ve declared May as the month of gastronomic austerity. A few weeks to let our digestive system recalibrate and our bank balance recover. Since my trip to Melbourne was one long birthday party of eating, drinking and chilling out that I enjoyed very much, it seems a shame to stop there. Being immersed in a foodie experience does wonders for cooking inspiration. Mine has taken a bit of a knock in recent years with people characterising healthy eating as some sort of punishment. And by healthy I mean not relying on one food type – i.e. carbohydrate – being the mainstay of your diet. There are so many wonderful things you can cook and eat that not just taste good but make you feel good too. So this week we’ve eaten well with some simple culinary twists on comforting foods. Monday was ricotta and spinach cake instead of frittata. Tuesday was chicken baked in milk giving it a whole new level of luxuriousness. I spiced up Wednesday’s vegetable soup to bring a sparkle to hump day. And, last night it was fish without the chips but still with mushed peas. Makes that food diary look fancier than it really was. If you believe what you read in the papers, like healthy eating, turning 50 is a depressing point in life. So far I feel uplifted with a new-found courage. Somehow I finally feel grown up in a way that never happened in earlier life milestones like turning 18, 21 or 40. For once being in the middle age doesn’t feel like being stuck in the middle, trapped by either side of life. Instead it feels liberating, simpler and potentially more exciting. And all because it’s your birthday and you’ve given yourself permission to think this way. It’s amazing what can happen when you give yourself permission to embrace something fully. Like giving up on baking with wheat flour. It’s not like my cakes ever rose to the occasion so embracing slow slung cakes seems like the perfect way to go. 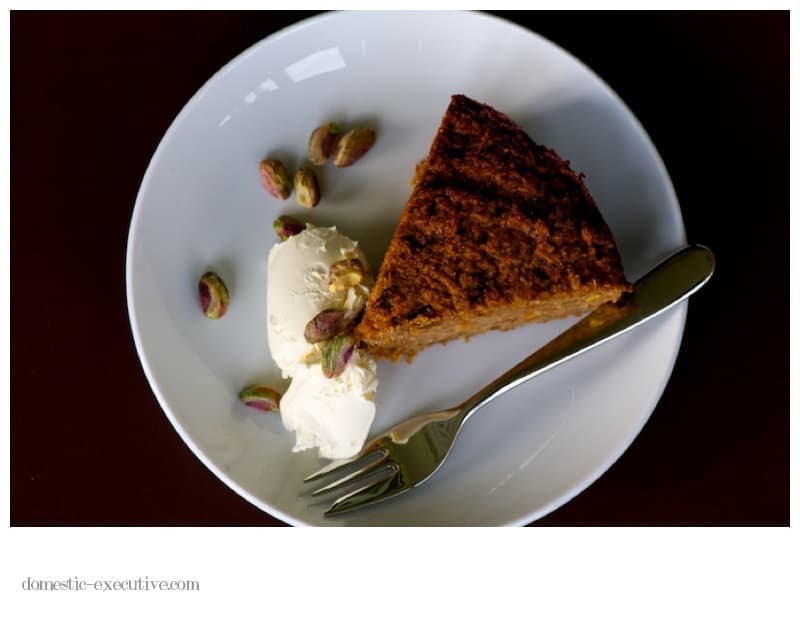 If you want to ditch the wheat and still enjoy a succulent and tasty cake I recommend you try this recipe for Spiced carrot, pistachio and almost cake. You’ll also find the recipe for Spiced Vegetable Soup on the link too. Middle eastern food seems in vogue these days. This is a cuisine founded on spices that bring a dash of flavour and exotica to otherwise pretty ordinary ingredients. All it takes is a bit of planning, preparation and a touch of spice to breath new life into your cooking. Perhaps that isn’t such a bad recipe for life too. Happy Happy Birthday Julie. Welcome to “le club”. I can’t wait to hear what you ate in Melbourne. I agree, there’s nothing at all depressing about 50. It’s freeing and fresh. Love the look of that cake by the way. A hearty Happy Birthday to you, Julie! It’s not so much your numerical age that counts, it’s your vibrancy age, and on that front you seem to be doing very well indeed!